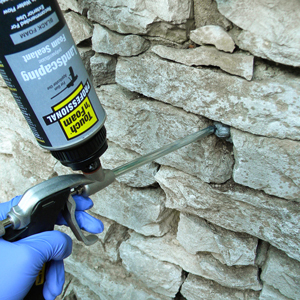 Loose mortar, cracks or other settling has caused rock, stone or concrete walls to develop gaps and cracks. 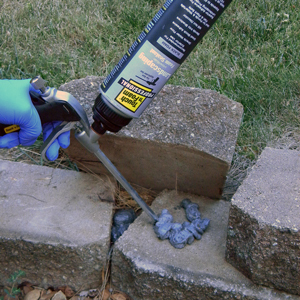 Remove loose stones or rocks, clean around surface and spray with Landscape Foam. Insecure rocks and stones are causing leakage in a backyard waterfall. Clean area as well as possible and use Landscape Ready to Use Foam or Black Landscaping Gun Foam to adhere rocks to surface. Note that foam will expand significantly so use accordingly. Need to seal cracks between sidewalk and foundation on home. Clean area and spray Landscape Foam into areas. 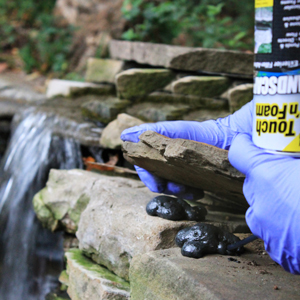 Touch 'n Foam Professional Landscaping and Touch 'n Foam Landscape are formulated to retain their black dispensed color and blend naturally into the surrounding landscape, even when exposed to direct sunlight. Great for use around ponds and most landscaping projects.